Finola Pinto is the woman who was in charge of our shipments from the Dubai side. One week after our arrival, all of the new teachers from my building still did not have our shipments. Most of us sent them in June. One was even coming from as close as the Philippines. We discussed Finola everyday. So much so, that one of my coworkers' children, who is only six-years-old, but very verbal, got the message. “Finola is not getting a Christmas card this year,” she said one day. No. Finola will not be receiving any kind of card from anyone in Al Barsha. Al Barsha is the area of the city where we reside. To say it is under construction is putting it mildly. Supposedly our building’s name is the Sheik Rashid; however, the name is not on the building, and we only know it by the plot number. It is a government building. Some people confirm that Sheik Rashid is the name, others say not. Here in Dubai we do not use street names or addresses. Mail goes to PO Boxes. If one is completing a form, not only does it ask for the building, but the landmark. Locations are dependent upon landmarks. All of the landmarks near our flats, aside from Mall of the Emirates and its famous ski slope, are new and therefore often unknown. This makes taxi cab rides and receiving deliveries an adventure all their own. Aside from living in Al Barsha, under construction in more ways than one on its own, we have the frailties of new construction to deal with. This adds to our daily problem-solution activities - most of which have to do with water - clearly. In short, living in Al Barsha right now is a little jacked up - to say the least. One day on our way to school, Caira was stating how she told Finola off the night before. “I told her about herself,” said Caira. “ I heard you told her she was a liar; did you?” said Ann. “Did you say exactly that - ‘you’re a liar? '” asked Ann with a combination of humour and curiosity. We all burst out laughing. Finally, something more accurate and politically correct than "rustic," "up and coming," “ghetto,” "desert oasis" or the adult version of "jacked up" to describe the situation we were in. Al Barsha. 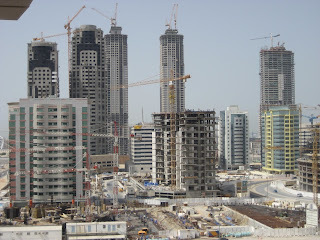 Al Barsha describes the fact that I won’t sleep past 5:45 on any day, due to the construction outside my bedroom window. Al Barsha explains all the plumbing problems. Al Barsha describes how dusty we might get walking through the sand and construction to catch a taxi cab, hopefully. Al Barsha is the best descriptor for the fact that we shipped most of our clothes, but that none of us had our shipments, nor had our washing machines been delivered. Al Barsha. “Al Barsha!” We all exclaimed.